The Metropolitan St. Louis Sewer District is required to post warning signs near every sewer overflow. 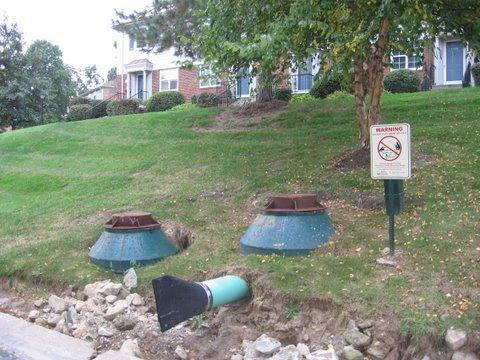 There are more than 200 sanitary sewer overflows in St. Louis County, like this one in a condominium complex in Brentwood. 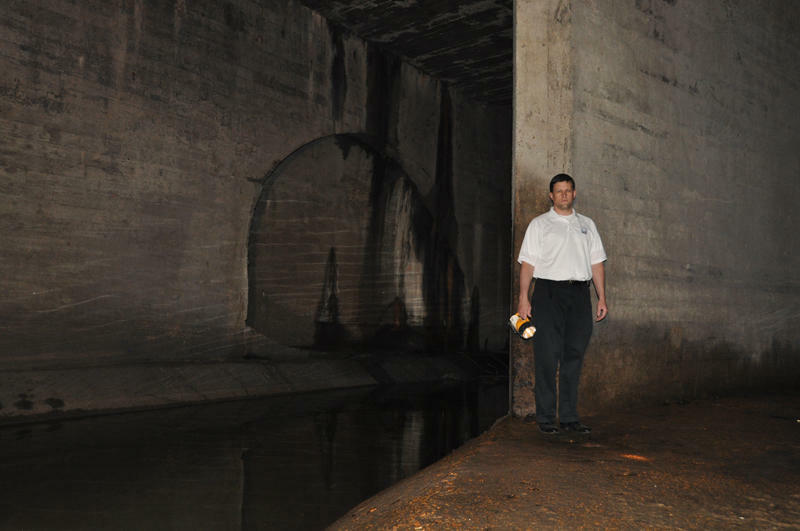 MSD spokesperson Lance LeComb stands next to one of the 29-foot diameter combined sewer tunnels that run under Forest Park. Raw sewage can be seen flowing by. The tunnels emerge again near Manchester and Macklind, into the concrete channel of the River Des Peres. 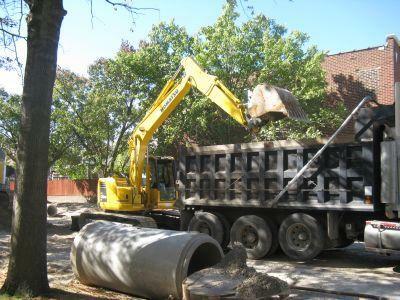 During dry weather, sewage runs under the channel to a sewage treatment plant. During heavy rains, a mixture of sewage and rain water overflows into the channel, carrying debris like this along with it. 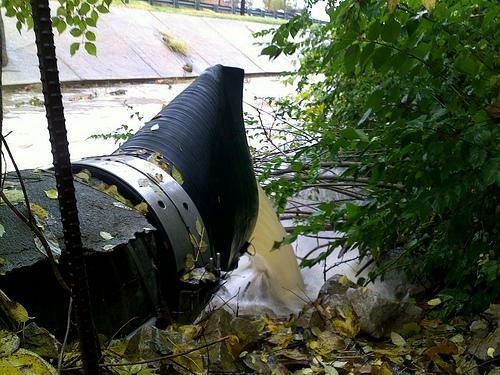 This combined sewer overflow (archway in channel) discharges sewage and rain water into the upper River Des Peres, on Ferguson Ave. just south of Melrose Ave. in University City. On the other side of Ferguson Ave., the River Des Peres runs by the backyards of these University City homes. During a storm, the water level can rise several feet in just a few minutes. 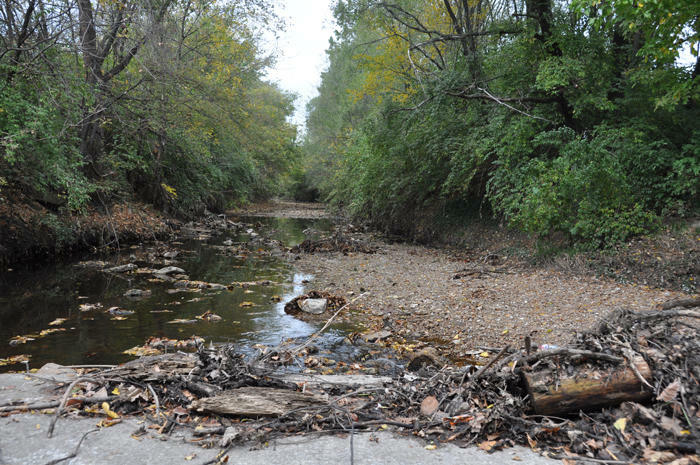 At the low water crossing in University City’s Heman Park, the River Des Peres flows over the road during storms, carrying debris and raw sewage along with it. 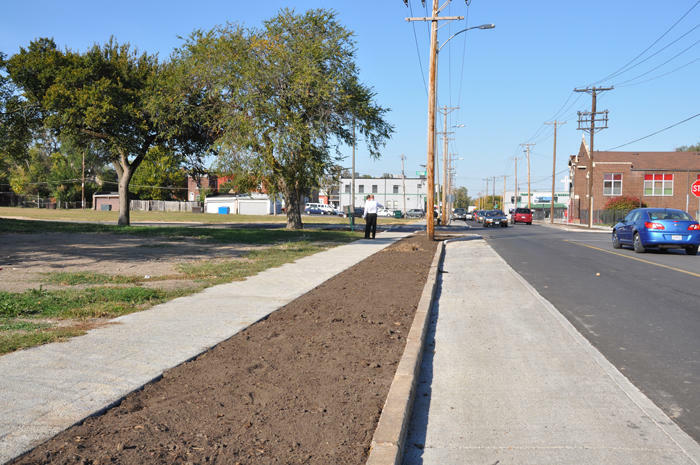 Along N. Sarah Street south of Page Ave., the sidewalks and parking lanes are paved with porous concrete as part of a “green infrastructure” demonstration project. 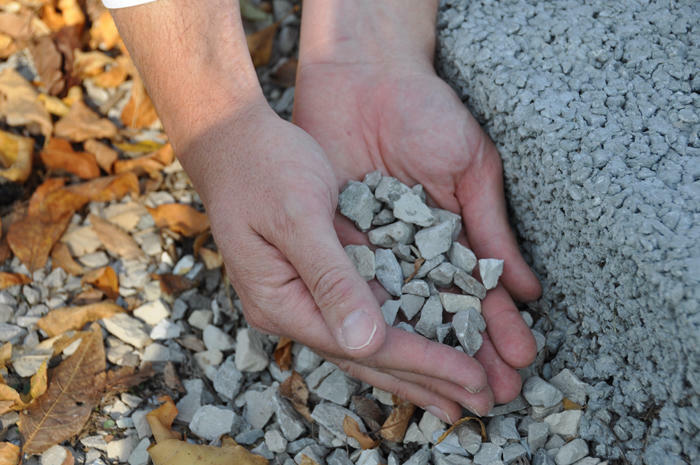 The layer of porous concrete is about four to six inches thick with about 12 to 18 inches of gravel underneath it, to slow the flow of water into the sewer system. 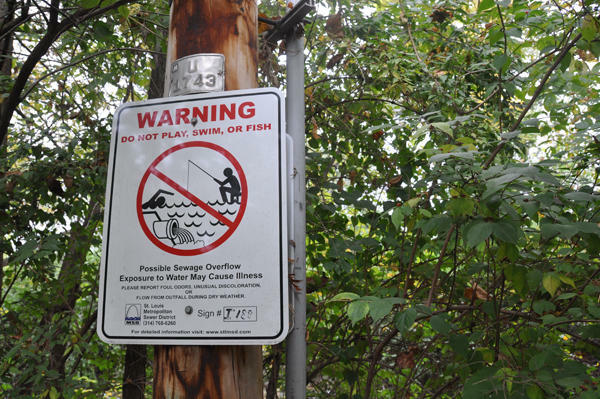 This summer, the Metropolitan St. Louis Sewer District settled a four-year lawsuit with the Environmental Protection Agency over violations of the Clean Water Act. Under the terms of the consent decree, MSD will spend the next 23 years upgrading the St. Louis area sewer system. In the first of a two-part series on the sewer overhaul, St. Louis Public Radio’s Véronique LaCapra looks at the problems with our sewers—and what it’s going to take to fix them. MSD spokesperson Lance LeComb is taking me on a tour. “This is sewage. This is raw sewage,” LeComb said. Our first stop is several stories under Forest Park. Behind us are two giant tunnels, each 29 feet in diameter. They’re all that’s left of this part of the River Des Peres, which was brought underground as part of a massive sewer project in the early 1900s. 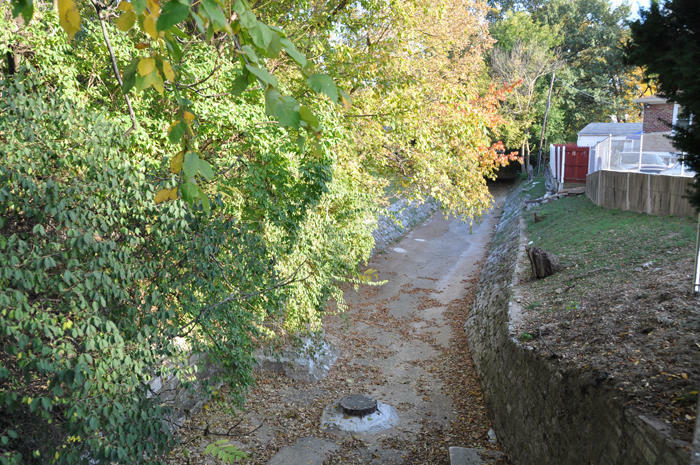 When it was first built, the combined sewer system was designed to carry both storm water and human sewage, untreated, into urban rivers and streams. It was considered one of the engineering marvels of its day. 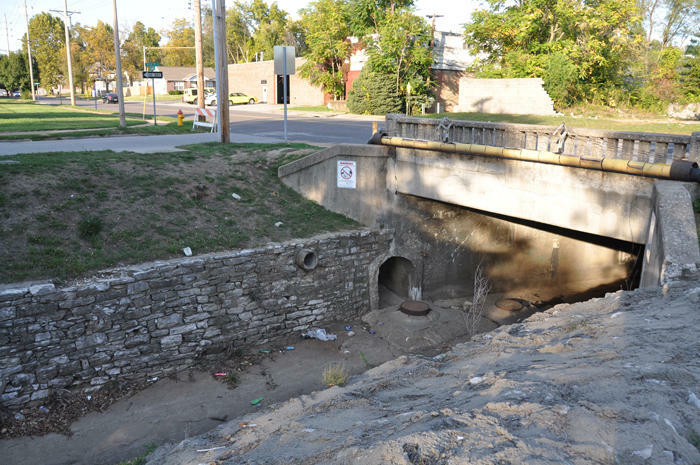 The River Des Peres comes out of those tunnels again south of Forest Park, into a large concrete channel that begins near Manchester and Macklind. LeComb leads me into the mouth of one of the tunnels, where I can see – and smell – the sewage flowing by through a grate in the tunnel floor. On a sunny day, the river channel itself is almost dry, and the wastewater flows underneath it to a treatment plant south of the city. 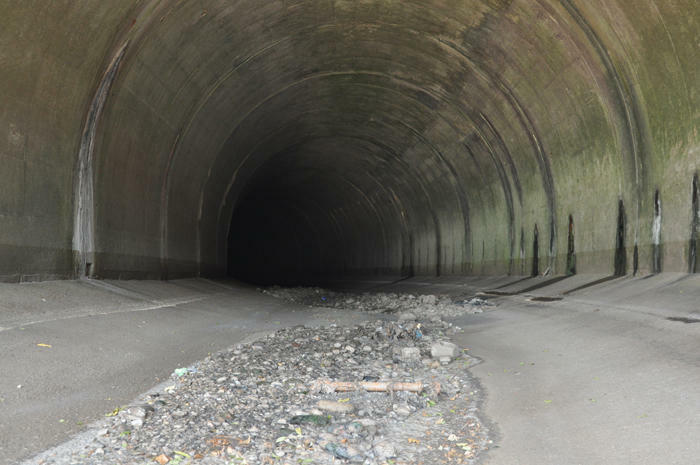 “Now if we get a bad rainstorm that comes through, and it exceeds the capacity of the sewers, this tunnel and the tunnel on the other side fill up with rainwater,” LeComb said. Rainwater mixed with sewage, that is. That water-and-sewage mix flows down the River Des Peres channel and eventually drains out into the Mississippi River. Those tunnels are large-scale examples of what’s known as a combined sewer overflow. Some 200 smaller ones are scattered around the city. They’re next to roads, behind people’s backyards, and in the middle of city parks. Kathleen Logan Smith directs the Missouri Coalition for the Environment, which joined the EPA in its lawsuit against the sewer district. “We took MSD to court because of the hundreds of millions of gallons of untreated sewage that enters our region’s waterways every year in violation of the Clean Water Act,” Logan Smith said. Now we’re in University City, where the River Des Peres flows through Heman Park. Here, surrounded by trees and playing fields, the river looks more like the natural waterway it once was. “It creates what appears to be a lovely natural area in the middle of the park that has a lot of combined sewer overflows discharging into it,” Logan Smith said. MSD principal engineer Jay Hoskins says the key is to keep that water from getting in the sewers in the first place. “Really what we’re dealing with in the city is too much water in the sewer system at one time,” Hoskins said. As part of the consent decree, his agency will spend $100 million on green infrastructure: things like rain barrels, rain gardens, and porous concrete that slow the flow of water into the soil. But meeting the requirements of the consent decree is going to take a lot more than green infrastructure. 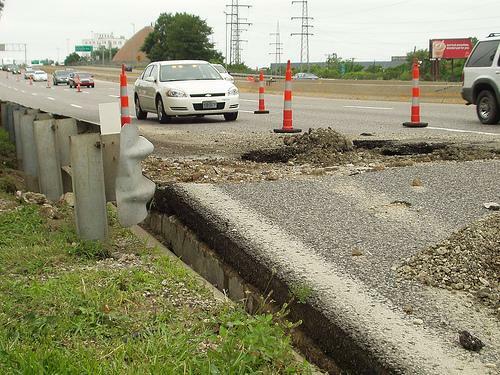 In St. Louis County, which has separate systems for sewage and storm water, MSD needs to repair old and damaged pipes and eliminate a couple hundred illegal sewage overflows. In the city, the agency plans to build three huge underground storage tunnels – the biggest one, nine miles long. During storms, they’ll hold several hundred million gallons of sewage and rain water until they can be routed to treatment plants. And MSD will need to do repairs and upgrades throughout the system to help prevent basement backups. Doing all of that will take more than two decades and cost at least $4.7 billion. In part two of our series: more on the multi-billion dollar price tag, and who's going to pay for it. 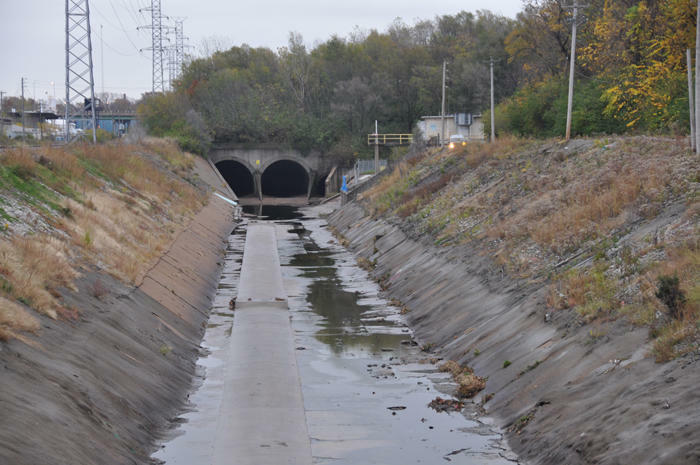 The Metropolitan St. Louis Sewer District has resolved a lawsuit with the Environmental Protection Agency with promises to fix its aging system. But the consent decree, which still must be signed off on by a federal judge, comes with a huge price tag, an estimated $4.7 billion over 23 years. In the second of a two-part series on the overhaul of the sewer district, St. Louis Public Radio’s Maria Altman explains MSD’s rate payers will be picking up the tab.